Here we go another match report from what feels like a long indoor season, maybe that’s the reason we lost, the long winter period has taken its toll on the well honed Taverner athletes. Bullshine, we were beaten by a better team on the day and Roberts didn’t score enough runs so well played to Sisler, we enjoyed a game played in the right spirit and we all hope you ride roughshod over the Cowboys of the Rider team if they get to the final. A brief synopsis of the match and post game joviality to follow below. Dan the umpire tossed a coin, the stand in skipper (me) called incorrectly and we found ourselves inserted to bat. Incidentally you may be asking yourself why a stand in Skipper, what could have indisposed Sicknote (Martins new nickname) this time, remember he was present at the venue to witness the toss, well he was complaining of a thick head (nothing new there then eh) so didn’t feel up to the physical torment of an indoor cricket match. Sid and Mark opened up and to be frank, they have played better, remember Sid (I’m top of the averages) Roberts has scored nearly 300 runs this season, between them they managed an insubstantial 27 I believe. With my unprejudiced eye I would add that the Sisler boys bowled very well and fielded outstandingly well, probably the best we have seen this season, with my prejudiced eye I would say that the pair had no plan B, ie smashing it as hard as I can at the back wall doesn’t bring any runs so Ill keep trying. The next 2 weren’t much better, Batman and Stumps thwacked about 30 or so (Batman having 23), and the last pairing Chomo and Toulson (24) tottered to around 30 giving us a very unimpressive 99. So we had to bowl and field exceptionally well to defend this paltry total, we started pretty well restricting the first pair to about 24, next in the Sisler skipper Jeggy, unfortunately we could not contain him and he and his partner scored more than 50 so that last the left pair wanting 18 to win. Needless to say they passed us quite easily although I think we had them slightly rattled. Highlights of the fielding and bowling were Mark Andersons 6 wickets and an all England catch involving Batman parrying a fierce cut into the air and me diving forward to catch the ball millimeters from the floor. Sicknote told me I was 2ft in the air when I took the catch but I would need video evidence to believe that, the only time I get that high of the floor is on a ladder. So with the bitter taste of defeat in our mouths we retired to the Pub to reflect and cleanse the palate with a few refreshing beverages. Sid could only stay for one as he had to dash of to coach some spotty youths in the finer points of the oval ball game, maybe his sub par performance was caused by this distraction who can tell. Is it just me or has anyone else noticed that the longer the days get as we approach the joys of spring the longer our sojourn to the pub lasts? Once upon a time we had a few and then all left, now we have a few, and then a few more and leave at different times, funny that! Anyway that’s all folks, our defeat prevented us from having to decide whether we should play against you know who. Why don’t we all turn up at the final game (if Riders make it) dressed as cakes and proceed to barrack the crap out of those tossers, just a thought. Cricket Canada has announced its first ever major sponsor, Scotiabank, a big boost for a country's cricket set-up which had been living "hand-to-mouth" according to its president, Ben Sennik. The board has agreed a three-year deal for an undisclosed sum that will make the company the premier national sponsor and official bank. The bank will sponsor both the men's and women's national teams as well as the senior and Under-19 championships in Canada. A Cricket Canada spokesperson told Cricinfo: "Scotiabank has been a long-standing supporter of cricket internationally, and their recognition of the position that cricket now has on the Canadian amateur sporting scene shows just how much the game has grown over the past decade or so. Their partnership with Cricket Canada will help to sustain that growth - importantly at the grassroots level and in our schools, as well as with the country's elite cricketers." "It's big day for us," Sennik told the Toronto Star. "It's very important, because it gives us now the muscle to go ahead in a more organised manner. The national team players are always in a dilemma because neither are they professional nor are they amateurs." In recent years, the Canadian Cricket Association - now Cricket Canada - has been putting itself on a stronger footing both administratively and financially including the appointment of a full-time CEO and a national coach. The involvement of Scotiabank is one further step in the process. The CA spokesperson said: "It is important because as the sport grows in Canada in line with the country's changing demographics and increased demands internationally, so the financial challenges increase." Canada is set for another boost with rumours that Sri Lanka Cricket (SLC) is about to sign a deal of assistance with them. Arjuna Ranatunga, the Sri Lanka CEO, was in Canada on a short visit recently and agreed to back Canada's national side. However, concerns were raised about the level of the support given SLC's well-publicised financial problems. And, contrary to reports, it is unlikely that Scotiabank's support will lead to Canadian cricketers becoming professionals, at least in the short term. "There are a host of other factors involved in that process," said the spokesperson. "But it is certainly a major positive step forward for cricket generally in Canada." Hi, its Wayne from Australia. I just want to contact Canadian cricket to say congratulations on what looks like the very exciting redevelopment of Canadian cricket. For someone like myself, who follows Canadian cricket with a passion its so exciting to read about such things as the planned league competition for Canada, and the T20 that is planned. I think it’s a great idea to include a baseballer in each team in this. I am also excited to read about Sri Lanka's partnership with Canada, and also that the ICC has marked Canada as a priority development nation, (well done ICC for the vision shown here), and any cricket academy in Canada is a brilliant idea. All this, I feel, points to the bright future for Canadian cricket. I look forward to one day sitting down to watch Canada play its first Test match. I have no doubts this will happen, thanks to the vision shown by cricket Canada, the ICC and such nations as Sri Lanka who have had the vision to get on board, and also but not least all the passionate followers and supporters of Canadian cricket. Cricket, the noble game, the manly game, was brought to Victoria, by Vancouver Island's first settler, Captain William Colquhoun Grant in 1849. At least, that was when the first set of wickets and bats to be used on the island arrived. Many of the fur-traders that populated Fort Victoria before the settlement period began in earnest, hailed from Britain and cricket surely would have been part of their cultural iconography. However, it was Captain Grant and the settlers that followed him during the colonial period that were responsible for bringing 'civilization' to Britain's North American outpost on the Pacific. Amongst the other trappings of Empire brought by the settlers, sports played a vital role in conveying what it meant to be British. To this day, cricket stands throughout the world as a symbol of the values and mores of British Imperialism. vol.8 no.2, June 1980 without attribution. The Americas Region has announced their team to represent the region at the forthcoming CLICO U15 World Invitational Tournament to be held in the West Indies from April 16th- May 5th. Fourteen players from five countries in the region will join together to represent the Americas in both stages of this competition. Of the fourteen cricketers in the Americas Region Development XI under 15 Team for the Clico Tournament, four of the young cricketers are Canadian. NIKHIL DUTTA is a right handed top order batsman, who plays with a very straight bat. He is a Right Arm off spinner, and regularly plays for the Ontario Cricket Academy. NITESH KUMAR has been appointed as captain of the Canadian team. Nitish plays for the Toronto Cricket Academy as a #4 right handed batsman, and a right handed spinner. Nitesh has many international tours under his belt, including the Caribbean and England. Last year he attended an academy in Bangalore. JOBANJOT SIDHU is a right arm fast bowler and is a useful right hand bat, playing in the Toronto and District League. TREVOR MANOOSINGH was born in Winnipeg and has represented Canada at the Americas Under 15 in Florida and his province (Manitoba) on several occasions. Meara Crawford's 6th over was completed by Deshannee Yamathugoda after the umpire ruled two (or more) high full tosses had been bowled. Oddments: The Tobago side had white shirts, the ball was white and the sightscreens were white and it was blazingly hot. But the players and spectators enjoyed the game. Canada's women cricketers put up a respectable showing, all things considered, in a loss to the Trinidad & Tobago Development XI at the National Cricket Centre in Couva on Sunday. The match was interrupted by several storms after a delayed start for rain. The Development XI won by 3 wickets under the Duckworth/Lewis system. Canada had made 43 runs for the loss of 3 wickets, after losing two early wickets, when play was first halted for a rainstorm. The innings resumed with a maximum of 29 overs (game scheduled for 40 overs per side) and Canada advanced to 85 runs for 5 wickets. Captain Mona Persaud top-scored with 24 runs not out, batting at number 5. Joanna White and Monali Patel each scored 14 runs. T&T's Amanda Samaroo, who starred for the T&T Under-17s at Maple Leaf CC last August, took 2 wickets for just 11 runs in 6 overs. A storm at 3.52 pm sent the players rushing for the pavilion with T&T Development XI on 42 runs for no wicket off 11 overs. There had been a missed catch in the early overs. Some might have thought that was it for the day and the match would be abandoned as a draw, but play eventually resumed with T&T needing to break a target of 20 more runs off 10 overs under the Duckworth/Lewis system. Captain Mona Persaud took 2 wickets, both bowled in an otherwise wayward first over when play resumed. She took another wicket to end with 3 wickets for ... runs. T&T side made 62 runs for 3 wickets in 12.5 overs to win comfortably, the game ending on a wide. Whitney Cudjoe lead the way with an innings of 23 runs not out. Despite the rain, the players of both sides enjoyed the experience and are set to meet again next weekend. By that time, Canada will hope to have much more practice and acclimatization (hopefully with less storms than to date), so will be looking for improvement in this developmental tour. 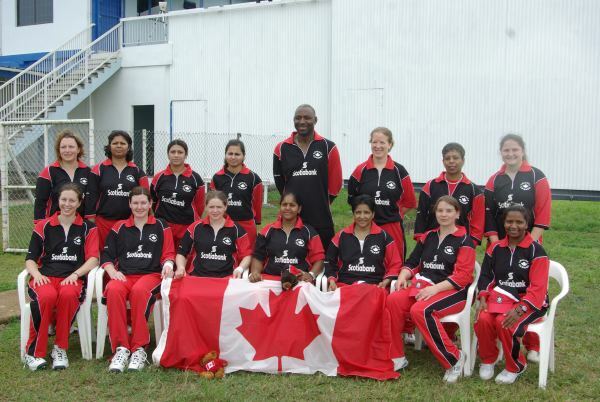 The Canadian Women's Cricket team before the opening match with the Trinidad and Tobago Development XI on Sunday April 12, 2008. It includes the 13 players, coach George Codrington (who played for Canada in CWC2007 in the West Indies), the assistant coach/team manager, plus the locally provided Liaison officer. 'Cricket', has just come to hand, and from it I was particularly interested to learn that Toronto possess as many as thirty-two clubs. It may be slow work, and I fancy baseball will always be the first love of the Canadains, but it realy does seem as if cricket is making definite strides in Canada. The above was produced in NOTES AND COMMENTS by M.A. TANFIELD in THE CRICKETER of Saturday August 4,1934 published weekly 'Registered for transmission abroad, Edited by P.F. Warner. The Kitchener-Waterloo area of southern Ontario has rich legacy of cricket since 1895 when the first club was formed in Waterloo. The Southern Ontario Cricket Association (SOCA) League it self had started around the time of World-War I. Immigrants from the Caribbean region formed most of the clubs. As time went by immigrants from South Asia such as countries like India, Pakistan and Sri Lanka were slowly settling down in this tri-city area. These new cricket-playing immigrants from South Asia were then playing with the older clubs who were run according to cricketing traditions in the Caribbean. For instance some founders of Sunrise Cricket Club, namely Parveen Sharma started playing cricket in this tri-city since 1990 and was with Waterloo cricket club until 1994. Similarly Jaspal Rana had also arrived into the scene since 1990 and was with Kitchener Cricket Club until 1995. Peter Jeranie (mukesh) too was a member of both Waterloo Cricket Club and Cambridge Cricket Club. A few of the south Asian cricket players had the idea of starting a new club with Asian players. They were confident that they could win the league championship. Thus in 1995 Parveen Sharma, Jaspal Rana, Irfan Arab, Dharmesh Modi, Kamal, Peter Jeranie (Mukesh) and Syd Wazir formed International Cricket Club (ICC) in Waterloo. Incidentally Peter Jeranie (Mukesh) was the only member who originated from Guyana, yet was integral in forming this new club. ICC immediately became part of SOCA. and played well in their first year. Next year the club admitted Bahadur Singh Mangat, Jang Singh Mangat, Nimesh Modi, Rudi and Rizwan Arab as part of the ICC squad. Later that season Dhramesh Krishnammagaru joined ICC. With the induction of Dharmesh K, the team moral soared high. Young guns like Bahadur found someone to look up to and they started performing well. Jang Singh was also a great supporter and helped to run the club smoothly. Both in 1995 and 1996 the club had reached playoffs. In 1997 two new players arrived in to the scene while Dharmesh K. had moved to Toronto and had quit ICC. The players who joined were Anil & Rajan Sharma. Due to inevitable circumstances, in 1997, the ICC was split and from that emerged Sunrise Cricket club.The initial constitution of the club was formed with the help of Mr Schmelling Ramlal. Next year in 1999, Parveen Sharma took over as captain. Incidentally Dharmesh K. who came back into to the tri-city joined Sunrise Cricket Club. The club played well and reached the SOCA Knock-Out finals as well as the League finals and were runner up in both finals. The club also added some new members such as Arfan Ahmed, Amandeep Singh, Jagtar Singh, Ajay Singh and Saqib Sheikh. Year 2000 was a tough year as leadership became split on petty and some avoidable political issues. However under the able leadership of Mr. Art Browne and Raghu Peddada, the club survived some nasty politics. Samuel Jones, Dharmesh Modi, Ajay Sharma and Rajan Sharma had to quit the club. Later just before the season started Raghu Peddada left for California, who became instrumental to keep the team together. Jaspal Rana became the captain. Sunrise was able to put everything behind and win the Knock-Out Championship. New player Ajit Singh (Tiger) was a key performer and moral booster all throughout the season. Inderjit Singh a 14year old was inducted due to talent beyond his age. By stroke of luck Raghu Peddada came back. Full of enthusiasm Mr Art Browne, Raghu and Swami Iyer joined in effort and laid the plan for success of 2001. Copyright © 2007 - 2008 Waterloo Sunrise Cricket Club. All Rights Reserved. 2008 marks the 86th year of the North Shore Cricket club. Our members pride themselves on striving for excellence on the field and great camaraderie off the field. We boast 5 teams in British Columbia Mainland Cricket League (BSMCL) with a level of play to suit all enthusiasts from juniors to experienced, competitive cricketers. Our home is Norgate Park in North Vancouver, BC. If you are interested in joining us for the 2008 season, please email us at: nscricket [at] gmail.com and we will contact you for required information. Alternatively, you can print out the registration form from this website, which will be available soon and submit it to one of our ExCom members. The fees are $225 CAD for adults and $125 CAD for juniors. North Shore Cricket Club is really fortunate to have Shaun Miller as the senior coach. He has a vast amount of cricket experience behind him, that he can pass on to our players to bring NSCC right to the top! Shaun Miller was born and raised in the U.K. He was an opening Right-Handed batsman, playing in the North Lancashire League. He also played minor counties cricket for Cumberland CCC, and represented both league Select XI's. He earned his ECB Level 3 Coaching badge in 2003. He played four seasons for Memorial CC in Houston TX and represented Central Zone/USA. Right now Shaun Miller is the 'British Columbia Elite Coach' for the CCA and is also a junior selector for the national team. All bonafied and active players from OCA member league players will be eligible for selection to Ontario teams which will be selected based on players' performance within the league competitions, and/or performance in Ontario Senior and Junior Competitions, Indoor practices during winter season and/or all other OCA sanctioned games. Each league selection chair will put forward the names of prospective players to Ontario Cricket Association's Selection Panel. The OCA Selection Panel will compile a list of players in consultation with National Selector representing Ontario and that list will be forwarded to Canadian National Selection Committee for selection to Canadian National Cricket Team. Under no circumstances, any player who is not actively involved in playing in his own league's games and those players who choose not to participate in Ontario Cricket Association's inter-league competition and any other OCA sanctioned/selected games, will be included in the final list of players to be forwarded to CCA for selection to Canadian National Cricket team. The CCA Selection panel will be free to select any players from within the list of Ontario players to be forwarded by OCA if the players meet all other requirements and conditions as may be required and stipulated by prevailing CCA policies. The 2008 National Championship will be held from May 17 to May 19 at the Maple Leaf Cricket Club at King City just north of Toronto on Dufferin Street. The inaugural overseas tour by the Canadian women's team will feature five matches in Trinidad and Tobago. The team leaves on April 10th and is due to return on April 21st. There are two matches against the Trinidad & Tobago Under-21 team, two against a Development XI and one against Tobago. The National Cricket Centre in Couva, Trinidad, will be the main base fot his tour. Mona Persaud is to captain Canada for the first time on this trip. Speaking after a practice session at Etobicoke's Qasra Sports, she said “It is a very young team. Not all the girls have got much experience but we are looking forward to this first Canadian team tour. It is going to be tough but we have been working hard, as you can see.” The players had been through fitness exercises and fielding drills in addition to batting and bowling in the nets. Sheryl Tittlemier had been working in the Greater Toronto Area for a few days and attended practices on March 29 and 30. She is based in Ottawa but was born in Selkirk, Manitoba. “I am absolutely looking forward to the trip” but was “not looking forward to the weather.” It has been a snowy winter in the GTA and Ottawa but the trip will bring a major contrast in temperature. This trip comes before the season has begun in Canada, so the heat is unlikely to be the only challenge, although the schedule was adjusted to ensure the players have a day or so to practice before the first match, which, in reality is not a lot of time. Canada beat Bermuda and Argentina to win the first ICC Americas Regional Womens' Championship in August 2007, but lost to the Trinidad & Tobago Under-17's. But it was useful experience, but experience gained 8-9 months ago by those involved in that event. Success will need to be judged by what the players gain from this experience. Sticking to the basics with bat and ball. Playing down the line of the ball and using up all available overs, when batting, and keeping to a reasonable line and length in bowling - possibly even something as simple as aiming at the off stump. And then there are the basics of fielding and fitness in addition to overall acclimatization. Best wishes to the Canadian players in this safari into international cricket development. The Wicket Maidens began as a co-ed cricket team in 2000 after some of the wives and girlfriends of league cricket players decided they would like to play cricket as well as watch it. Currently the Wicket Maidens play in the Victoria and District Midweek League against the men's teams. There are approximately 30 active members. In the coming season, we hope to attract even more women to one of the leagues fastest growing teams playing in the mid week league. The Wicket Maidens range in age from early teens to a "certain" age. Our team's philosophy focuses on working together to expand each players skill sets, challenging ourselves and other teams while having a great time learning the sport of cricket. Several member of the Maidens represented Canada in clinching the first-ever ICC Americas Womens Championship after a resounding 5 wickets. Canada beat Bermuda by 5 wickets in an enthralling contest at Maple Leaf CC, and thereby won the first-ever ICC Americas Womens Championship. When I was a high school student about 40 years ago, phys-ed classes were the same thing every year running outdoors wearing maroon school shorts in the frigid fall, trying to twist an unco-operative body over a pommel horse, and attempting to show your co-ordination by running fast and jumping over hurdles at the same time. Thankfully, the phys-ed programs are changing . . . for the better. The Ontario Federation of School Athletic Associations in conjunction with the Ontario Trillium Foundation has continued its Try Day program, which will allow 140 high schools across the province to introduce new or non-traditional sports or physical activities to their programs. Five Ottawa schools jumped at the opportunity for an $800 Trillium grant for 2007-08 to bring a breath of fresh air into their sessions and to motivate teens to get or continue to be active. Rideau and Ridgemont are concentrating on cricket. A.Y. Jackson prefers disc golf. St. Paul will serve up beach volleyball. Glebe has opted for tchoukball. Rideau has bought equipment and had players from the Ottawa Valley Cricket Council run workshops for its Grade 9 classes. It was a natural choice as students played the game during lunch hour last year. Teacher Deb Tully wants to add cricket to the overall phys-ed program, start a club in the spring and have more guest speakers for next semester. A group from the Ottawa Cricket Club introduced the game to Ridgemont students last year, and athletic director Gio Donato now wants to add cricket to his phys-ed program by November. The idea has been well received by students, especially those who are new to Canada and played the game in their homeland. Grade 9 students at Jackson will experience disc golf on Oct. 17 and phys-ed head Cheryl Hyndman would like to make it part of the intramural and phys-ed programs. Beach volleyball is coming back to St. Paul, after Kendra Read organized a successful tournament last week. Athletic head Lee MacKay plans to create two sand courts on school property and add the Olympic sport to his phys-ed curriculum. Kirk Dillabaugh, the cross-country running and track and field coach at Glebe, will introduce Grade 9 students to tchoukball in February, 2008. Last year, he brought cricket into the school. Despite being a competitive game, he likes the idea that tchoukball emphasizes teamwork, avoids conflict and has one goal: Fair play that joins two teams in a one activity. Certainly beats trying to survive a ride on the pommel horse. It has come to my attention that there is some school cricket activity in the foothills of the Rockies.